The Launch Pad: Friday Fun Day #FFD - Who's your Favorite Space Explorer? Friday Fun Day #FFD - Who's your Favorite Space Explorer? With Monday as a holiday here in the U.S., this was a short work week for us here at X PRIZE. But with the Northrop Grumman Lunar Lander Challenge starting tomorrow (Armadillo will be attempting to win the $1,000,000 prize, but more on that later), the Moonbots LEGO Challenge ramping up, Google Lunar X PRIZE updates, and lots of exciting space news happening, it definitely had the feel of a regular work week! I've been tuning into the STS-128 mission this morning, listening for updates on the landing today either in California or Florida. Astronaut Rick Sturckow, aka "CJ", is commanding the STS-128 mission. In my past life at NASA I was lucky enough to occasionally work with CJ, who is undoubtedly one of my favorite Shuttle astronauts. He is a calm and collected in stressful situations, always smiling, and easy to get along with; overall, he's just the guy that you would want as the Commander of your space mission. This made me think, who are YOUR favorite past or present astronauts/cosmonauts/spationauts/taikonauts? And why? It could be for a major achievement, such as Yuri Gagarin, first man in space in 1961, or Valentina Tereshkova, the first woman in space (1963). It could be for bravery or demonstrated skill or significant contribution to the space exploration. They can be from the Mercury program or SpaceShipOne. But let's hear about who your personal greats are. 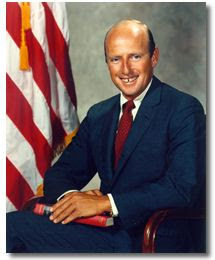 My personal favorite is an Apollo astronaut, and mostly for his personality: Pete Conrad, the third man to walk on the moon ("and the first to dance on it"). Pete didn't have the typical background that you would expect of an astronaut, but he overcame his challenges to eventually attend Princeton and later walk on the moon. He has a famous quote, "If you can't be good, be colorful", and had a passion for learning and innovation that is now carried on through The Conrad Foundation, a program for students. How about you? Post your responses below, or send a quick message to @glxp and we'll put them here. Have a great Friday!